It goes without saying that all great parties start with an epic pre-game, and we pre-gamed in style on this live broadcast from Loews Ventana Canyon Resort as the clock ticked down for their first annual Rockabilly & Blues BBQ! 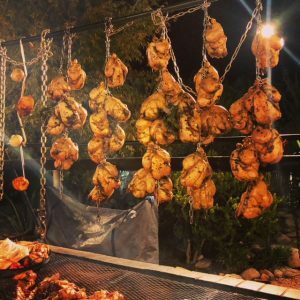 One of the Rockabilly & Blues BBQ culinary stations: Top Knot Farms chicken suspended over a live fire by chain cables! 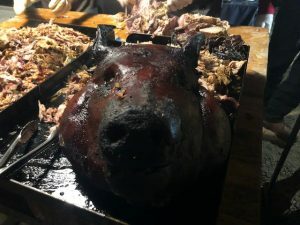 One of two 180-pound hogs that was smoked for guests at the Rockabilly & Blues BBQ! Flying V Bar & Grill at Loews Ventana Canyon, who unveiled some of the new seasonal dishes that are stars of his new fall menu! What a way to shake, rattle, and roll! 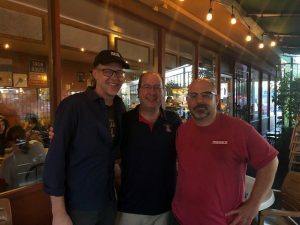 Fall is harvest season in the wine world, and this was a great context for sharing our passion for grapes, and the fall flavors that complement them, on this live broadcast from Maynard’s Market & Kitchen, the home of Tucson’s Iron Chef! Our celebrity co-host was wine authority Greg Shepard of Breakthru Beverage, who talked about the kinds of wines that he’s grooving on this fall. We also caught up with famed California winemaker Bob Blue of 1000 Stories Wines, who shared some fascinating small-batch stories about aging Zins in bourbon barrels. Will Olendorf, sommelier at Maynard’s, joined the conversation as well with information on his upcoming Grapes to Glass event, and Iron Chef Brian Smith revealed his perspectives on fall with a look at his new fall menu. 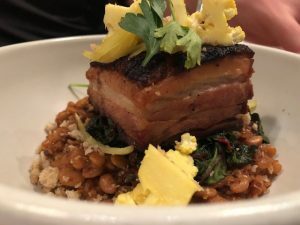 New on the Maynard’s fall menu: Crispy pork belly with barbecued tepary beans, Swiss chard, bread and butter cauliflower, and smoked bread crumbs. Boom! True comfort at the center of the plate! “For Immediate Release!” This is the standard element of a press release that indicates to its media recipients that news can be shared the moment that it’s received, and we released some news about a brand new beer that was officially released on this live broadcast from Dragoon Brewing Company! Our celebrity co-host was fellow foodie and loyalist on the local libation scene C.J. Hamm, who got us current with news from Saguaro Corners and Mulligans. We then caught up with Chef Ken Harvey of Loews Ventana Canyon Resort, who shook, rattled, and rolled-out all the details for his upcoming Rockabilly & Blues BBQ. Casking was all the buzz as well, especially when we sat down with Dragoon’s own Brittni Rawlins who presided over Cask Conditioning 101. The latest release from Dragoon…Frosty Friends! And then came Tristan White, Dragoon co-founder and manager, who briefed us on things making news in his west side Tucson tap room,including the just-released Frosty Friends, an American Pale Ale they crafted in collaboration with Finley Distributing. Chicago Cubs fans were experiencing some Windy City woes this week, so what better place to heal those wounds than at the destination for this week’s show, Rocco’s Little Chicago Pizzeria! Our celebrity co-host was Herb Stratford, a classic pepperoni guy and director of Film Fest Tucson who revealed some of the fun films in the line-up for his third annual event. We also sat down with veteran Rocco’s manager Evan Stevens, who talked about some of the beverages that were trending behind the bar including old school brews, modern craft brews, and signature cocktails! And then the righteousness of Rocco’s took center stage when Rocco DiGrazia himself, the pride of Chicago’s south side, joined us as we launched National Pizza Month in style! 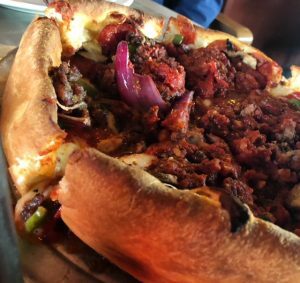 The “Kitchen Sink” deep dish pizza. There are no words. We talked about the wisdom of the Windy City that was symbolized by deep dish pizza, Midwestern thin pizza, wings like none other, and a spaghetti and meatballs plate that was inspired by Rocco’s late grandma Marinara Marian. We’ll see yous guys at Rocco’s! Polished. Casual. Unconventional. Memorable. Traditional. Modern. These are some of the words that define a downtown hot spot that tells a fascinating story of Japanese culture and cuisine. And we were at the center of that story when we came to you live this weekend from OBON! Our celebrity co-host was fellow whiskey enthusiast and member of the Tucson Medical Center communications team, Jim Marten. Jim showcased some of the Scotches he’s been enjoying in this early fall season with their distinct expressions of barley. We also caught up with Michael Luria of Children’s Museum Tucson who shared the news on his upcoming Evening of Play (an event that Jim Marten is chairing!). We then made our way over to the OBON bar with mixologist Marlee Palmer who revealed some Asian inspirations for her libations, while Chef Creamer whipped up some wonderful and reportedly weird stories from the back of the house. 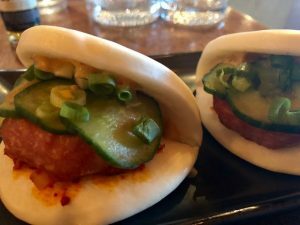 Fried Spam steam buns with kimchi, house-made pickles, green onion, and spicy mayo. Right? We experienced the perfect pairing of Marlee’s Gangnam Style cocktail with toasted sesame infused vodka and Creamer’s fried Spam bun with kimchi and ponzu cream! You may have seen the news that change was coming to Tucson’s own taco garage. Well, change has come, and we came to you live from the newly imagined space that still promises that they fix hungry, Sir Veza’s Kitchen & Kantina! Our celebrity co-host was fellow foodie and drive-time radio wonder Mike Rapp, host of Tucson Morning News on KQTH, who briefed us on his latest action, including his participation in Real Men Wear Pink to support the American Cancer Society. 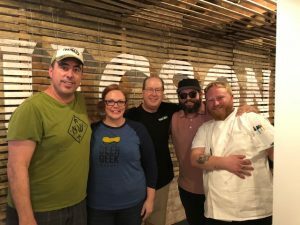 We were then joined by John Aldecoa of Brother John’s Beer, Bourbon, and BBQ who threw his own hat in the ring to support Mike’s efforts by donating restaurant proceeds to Real Men Wear Pink. Listen for the delicious details! We were then joined by Sir Veza’s own Ray Flores and Gary Hickey who revealed the fresh new concept in a space we’ve loved for years. Man vs. Taco. And it’s a salad! 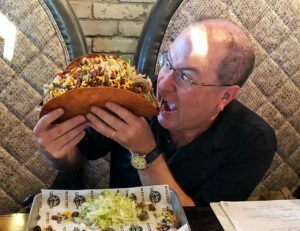 Our tasting included a hemp tamale, kantina nachos, all-natural Sonoran dogs, and a taco salad served in a 14-inch taco shell that you have to see to believe! We closed out with Michael Elefante of Mama Louisa’s with information on this year’s Tucson Knife Fight finals! The Mercado San Agustin & MSA Annex is a vibrant market district on the west end of the Modern Streetcar line and is home to several local destinations for deliciousness, and we came to you live from one of its best…Agustin Kitchen! 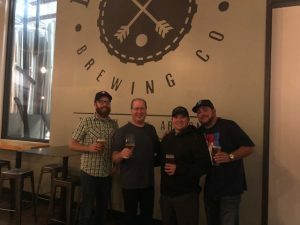 Our celebrity co-host was Arizona craft beer pioneer Dennis Arnold of Barrio Brewing Co., who talked about some of the things making news at his tap room. We also checked in with Chef Javier Castro of Casino Del Sol, who shared the latest news from the upcoming House Party to benefit the Ronald McDonald House. We then sat down with two local taste-makers whose concepts at the MSA Annex are buzz worthy, Rebecca Safford of Westbound and Michael McCormick of Kukai! Our featured guests were Agustin Kitchen owner Sally Kane and executive chef Alex O’Neill who walked us through their thoughts on west side cuisine. A fan favorite: fried cactus pads with a duet of dipping sauces! 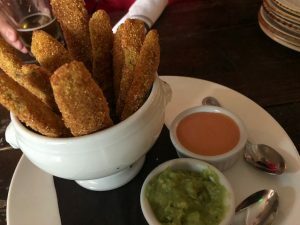 They also showcased a fan favorite from the menu, the nopales fries, while teasing us on a new dish about to drop on the new seasonal menu. Coffee-rubbed Arizona filet mignon with Israeli pearls, a coffee-reduction tuile, and young peach gastrique anyone? Food and beverage play central roles in any football experience, and this week’s show was dedicated to the eats, the drinks, and the settings that quickly find their way to any football fan’s heart…the Frozen Cactus Ice Bar & Flame Grill! Our celebrity co-host was fellow foodie, football fanatic, and director of sales for Tucson Indoor Football, Rob Gallo. 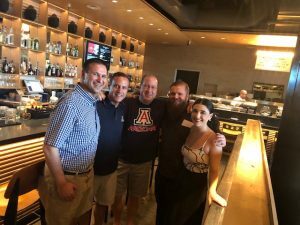 Rob revealed the latest news on Tucson’s new football team, while sharing some of his favorite game day eats and drinks. We also caught up with national BBQ authority and TV star Danielle “Diva-Q” Bennett, who shared her tips for maximizing your next tailgate party. 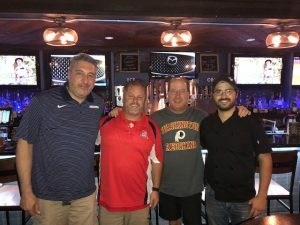 We were then joined by the Frozen Cactus’ Richard McClelland and Hector Sandoval who took us on a tour of their ice bar and flame grill concept, while showcasing some of the food and brews that make a football game experience complete! 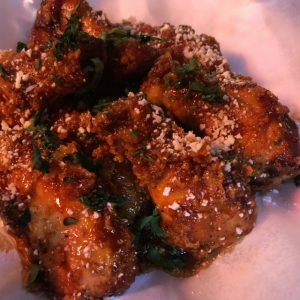 Buttermilk-marinated chicken wings with a sweet and spicy sauce, cotija cheese, and cilantro! A true touchdown for your taste buds! 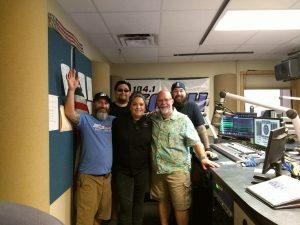 Matt was out of town this weekend judging yet another epic food competition, so this show came to you live from the KQTH studio with guest host Fred Ronstadt, executive director of the Fourth Avenue Merchants Association! Fred updated us all on the fun and frolic on Fourth Avenue these days, while celebrating the anniversaries of some of the Avenue’s most delicious destinations. 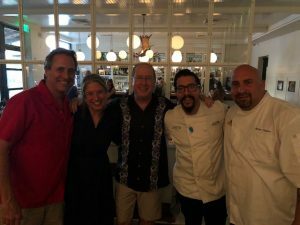 Fred’s guests included Americana Recording Artist George Miguel, Micah Blatt and Ben Sattler of the Drunken Chicken, and Maria Mazon of BOCA Tacos y Tequila. See you soon on the Avenue! 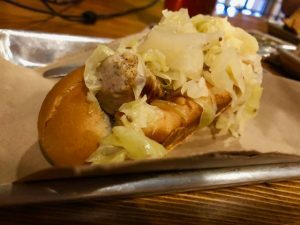 In the science of food and beverage pairings, not many companions make for a better chemistry connection than a premium hand-made sausage and a local craft beer, and we rejoiced in the bounty of both on this live broadcast from the new Ten Fifty-Five Brewing & Sausage House! 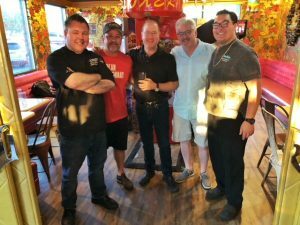 Our celebrity co-host was fellow foodie and AM drive time radio man Chris DeSimone, who shared some of his latest adventures including a recent visit to sausage and suds town Milwaukee! 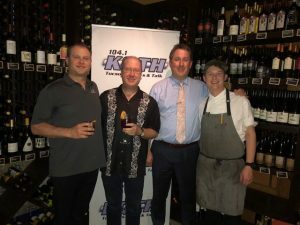 We then caught up with Tom Firth of the Hacienda del Sol who had some delicious things to report about his upcoming Tucson Heritage Food & Wine Festival. 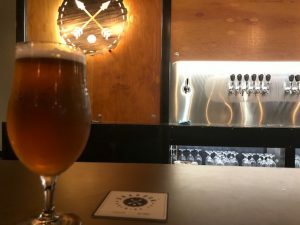 Ten Fifty-Five’s co-owner and head brewer JP Vyborny sat down with us as well to share some reflections on the first two weeks in his new downtown digs. Ten Fifty-Five’s chef Ivor Cryderman joined the party as well and told some stories about his culinary journey, his great, great, great grandmother’s role on his menu, and his passion for sausages. The Leap Polish sausage, inspired by Chef Ivor Cryderman’s great, great, great grandmother! We even got to try a tasty trio…Leap Polish sausage, Belgian fries, and some pimiento cheese! Ema Peterson of the Beer Geek Bakery wrapped things up with some beer-forward desserts. The cherry oat stout chocolate brownie with a sage crust was bomb!